Wishing You a Most Blessed Easter! At this time of year, I wish you a most blessed Easter. I finally finished 2 projects (1 fun, another to commemorate the true spirit of this holiday!) that I wanted to share with you today. This is a container (I bought the tutorial from Inking Idaho last year!) that holds 4 of the mini milk cartons that use the Sizzix Milk Carton Die from Stampin' Up. I filled each one (4 colors, 4 different Easter candy treats!) 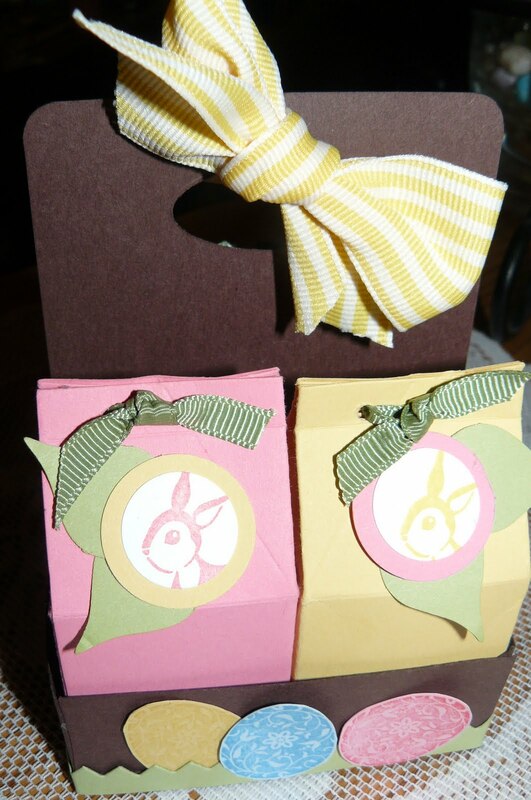 to the top with fun candy, and then decorated the cartons with my Forest Friends stamp set. 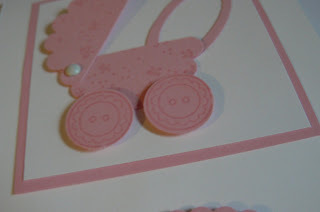 I wanted to use the Accoutrements stamp set that was available last year (so cute!!) but since it's retired, I didn't want to entice anyone with something no longer available. The Forest Friends bunny is adorable, but he should have been punched with something larger than the 3/4" punch I think -- you're missing the best part -- his adorable tail! Anyway, the container holding the cartons is decorated with the Tasteful Trim XL die -- I actually used the "negative" of this die -- rather than using the rick-rack trim, I used the piece of paper remaining after removing the rick-rack. It was a bit larger and more "random" (Lyndsey, my daughter, thought that the scallop trim I originally used was "too predictable" and "lacking texture"!!) 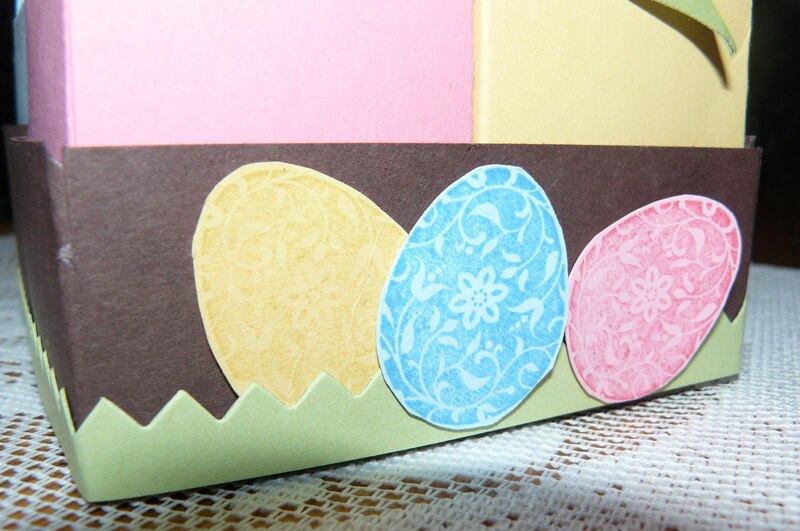 I stamped the Easter eggs in random pastel inks on pastel card stocks using the Easter Blossom Stamp set. 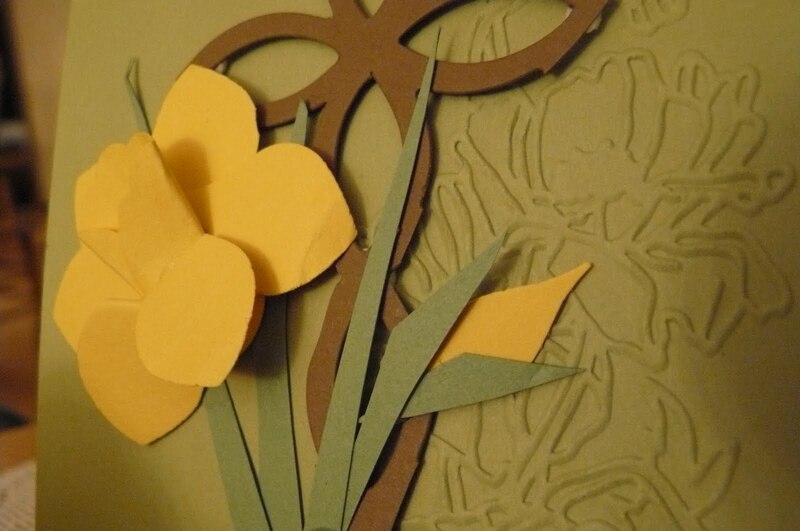 The finishing touch ... the luscious Daffodil Delight 1 1/4" striped grosgrain ribbon. Love this ribbon which is probably why you haven't seen a whole lot of it -- I tend to "hoard"!! Here are 2 other views. I apologize that the photo quality isn't fantastic -- I took the pictures using my night-time lighting since it took me all day to finish these! My final project for today is something I've had in mind for a while, but making it work wasn't as easy. I do love how it turned out, even if my son totally missed the point of the card!! I finally received my lattice die from Stampin' Up -- it was backordered for a little while this month. I think I've seen the cross using part of the die before although I'll never be able to identify the source or the original. I also received part of my Summer Mini Catalog pre-order this week -- I love the new Flower Garden textured embossing folder! (It's pictured backwards in the mini catalog in case you're really observant!). I used my Big Shot to emboss the image on some Pear Pizzazz card stock. The hard part was using my Big Blossoms punch to make the flower -- can you tell it's a daffodil? 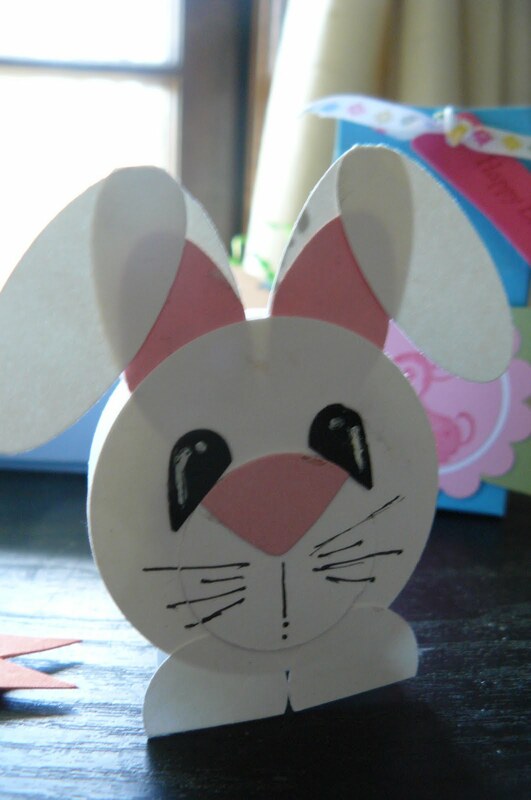 Chris figured that out, but thought my cross was a mis-shapen bunny!! Yikes ... isn't it obvious?! The Wild Wasabi leaves are just scraps that I randomly cut. My sentiment is also from the Easter Blossoms stamp set. I stamped in VersaMark and then embossed in gold -- it's punched using the Decorative Label punch. Anyway ... I do hope everyone has a blessed Easter tomorrow. I'm so looking forward to our church service. On Easter Sunday, we share the service with a Korean church that uses the chapel of our building for their services each week. Their choir is wonderful and they have a fabulous bell choir too! If I don't get to bed though, I'll be missing my sunrise service that I finally have the opportunity to attend -- usually I'm working overnight on Easter weekend so this is truly a treat! May God bless all of you as we celebrate Him tomorrow! He is Risen!! I'm back again, only quickly, to share some Easter projects with you. Sorry for the photo quality! I didn't say anything about my milk carton in the photo below -- I'm hoping to have a fabulous project to show you tomorrow! This is a group photo of all of the 3D projects. I guess the card that we made didn't make it into this photo. You can see a close-up of 2 of the projects in the photo. The photo on the left is my peppermint patty bunny. I'm having a hard time finding the originally wrapped patties, but my local grocery store was carrying some patties made by Palmer -- they were in pastel wrappers (perfect! ), and they tasted really good besides! 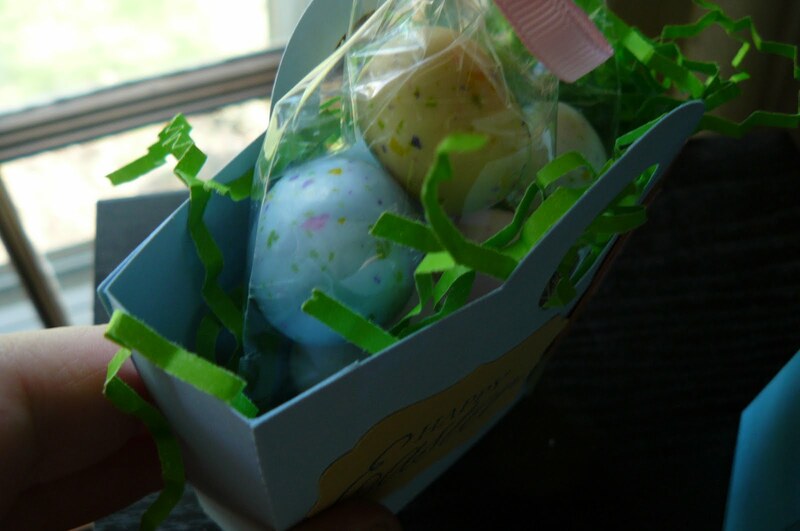 My Easter class attendees had to do a taste test, and we unanimously decided the the Palmer patties were creamier! Imagine that! 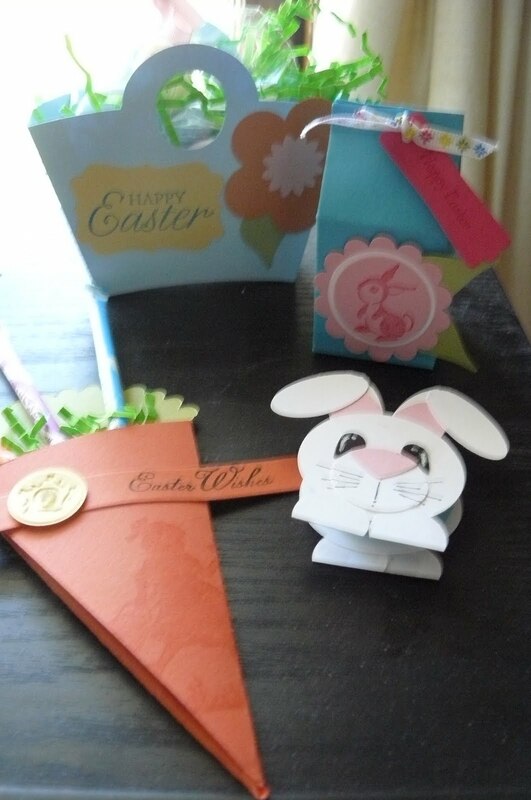 The photo on the right uses the new Petal Cone die and the Easter Blossoms stamp set. I stamped the girl with Versamark ink to give it a tone-on-tone design. 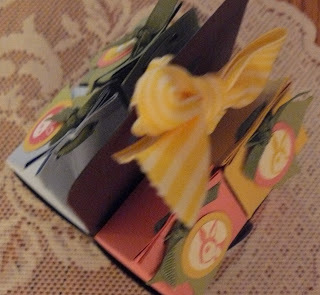 The button is one of the Button embosslits -- hey, where did my narrow grosgrain ribbon go?! Oh well, the embossed button is pretty just like that too! I got the pixie stix from my dollar store -- what I don't give away, my kids are squirreling away from me! They love those stix!! This last photo is the inside of the Easter basket that I made -- I used the Baskets and Blooms XL die with my big shot to cut the basket, but I wanted some room inside for my Robin's Eggs. 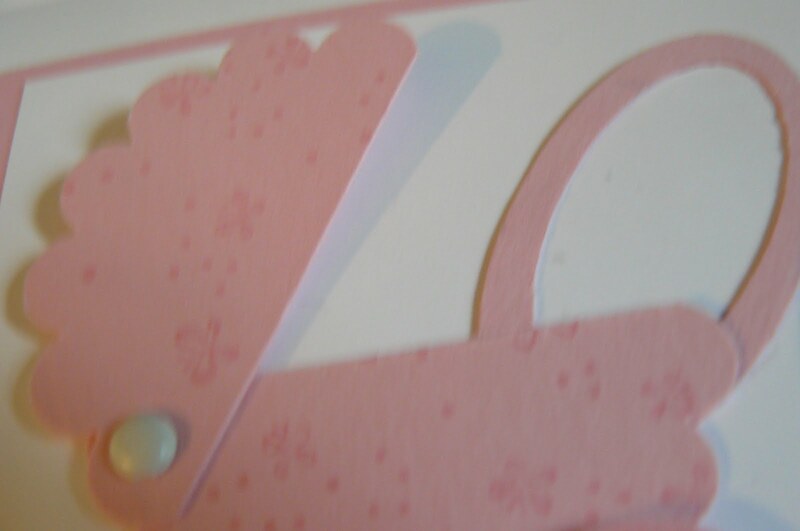 After cutting out the basket, I cut out 3 strips of paper: (2) 2" x 2 3/4", and (1) 2" x 4". On the shorter strips, I just scored them at 1/2" on each side for the sides of the basket. The longer strip was scored at 1/2" on all 4 sides. I then used Sticky Strip to attach them to the sides of my basket. I'd love to say that the grass was "homemade" but I don't have that kind of time! Have a wonderful day! I'm headed off to work overnight again tonight, and then tomorrow my mom comes to visit for a few days from upstate NY! Love it! Can't wait to see her! Quickly Sharing! 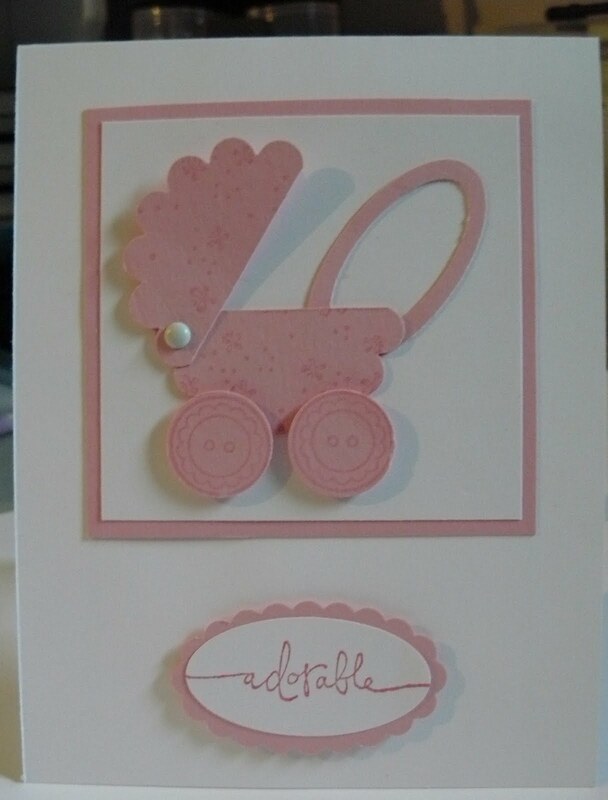 A Super-Quick Baby Card! Hi all! I've been perseverating for the past 4 months about what was worthy of being a first post in my LONG disappearance from blogging. I was so uptight about getting this first one done that I lost perspective -- my stamping friends have told me they just want to see a post, with or without details! One of my close girlfriends had a baby last weekend, an adorable baby girl (her fourth girl!!) who is truly a gift! I made a quick card and thought I'd share that with you. 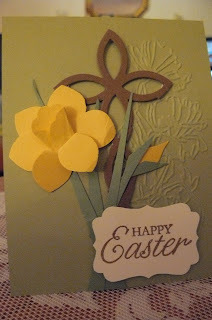 Tomorrow I hope to share some of the projects we've made in stamping classes recently in preparation for Easter. This card was quickly made with punches, and I know I've seen it elsewhere on Stampin' Connection, my online Stampin' Up! Demonstrator website and resource! Check it out! I think it's self-explanatory, but if you have questions, just leave me a comment and I'll get back to you! Besides punches, I used the Button, Button stamp set and a retired stamp set called Warm Words, but any scripted sentiments would probably work here! These aren't the best photos, and I apologize, but I promise to add more posts in the future! Stay tuned! Thanks for sticking with me!